Adrian Peterson attends the Jordin Sparks & Jason Derulo Welcome to New York Red, White and Black Super Bowl Party at WIP on Jan. 29, 2014, in New York City. After a second allegation of child abuse and heavy criticism from fans, the Minnesota Vikings announced early Wednesday morning that running back Adrian Peterson has been barred from all team activities and has been placed on the "NFL's exempt/commissioner's permission list until his child-abuse case is resolved," ESPN reports. "After giving the situation additional thought, we have decided this is the appropriate course of action for the organization and for Adrian," Vikings owners Zygi Wilf and Mark Wilf said in a statement viewed by ESPN. "We are always focused on trying to make the right decision as an organization. "We embrace our role—and the responsibilities that go with it—as a leader in the community, as a business partner and as an organization that can build bridges with our fans and positively impact this great region. We appreciate and value the input we have received from our fans, our partners and the community." Initially the Vikings made Peterson inactive for last Sunday's game when news surfaced that Peterson reportedly beat his 4-year-old son with a switch. 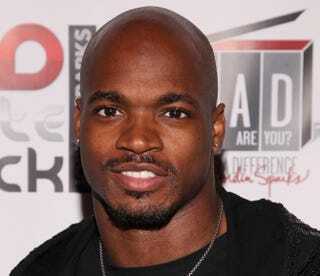 The Vikings reinstated Peterson on Monday. Later that same day, allegations surfaced that Peterson was involved in a similar act of abuse, reportedly beating another 4-year-old son. That mother reported Peterson to Child Protective Services, but no investigation was ever conducted. The Peterson ban comes after Sen. Al Franken (D-Minn.) and Minnesota Gov. Mark Dayton, "who spearheaded an effort to secure $477 million in public money to help build the team a new stadium … were among the many who called for the Vikings to reconsider their position," the Associated Press reports. "This is the best-possible outcome, given the circumstances," Ben Dogra, Peterson's agent, told AP. "Adrian understands the gravity of the situation, and this enables him to take care of his personal situation. We fully support Adrian, and he looks forward to watching his teammates and coaches being successful during his absence." Read more at ESPN and CBS Boston.